ARPCHS Students watch the premiere of their stop-motion animation videos with rapt attention. For two years, CAW has partnered with A. Philip Randolph Campus High School to provide programs for alternatively-assessed students – those whose graduation plan does not include passing Regents exams. Working in collaboration with the APRCHS Special Education faculty, CAW developed lesson plans that helped students build connections between art projects and content from other classes. 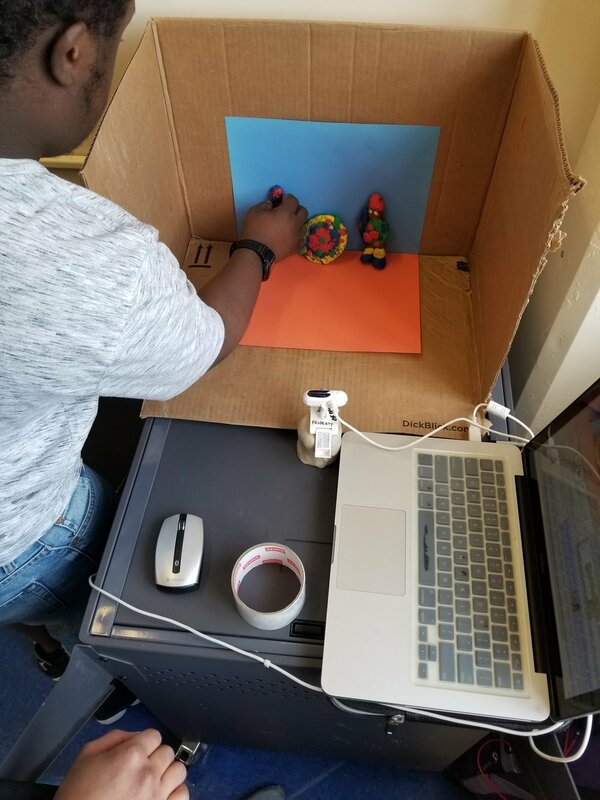 Students used a webcam connected to a stop-motion animation program to make minute adjustments to their figures in order to make them appear to move. The computer screen uses a split screen which allows the animator to compare where the figure was in the previous frame and how much to move it for the next frame. Students created artwork for lobby posters to promote their videos. A short clip from Brenda's stop-motion video.